The classic musical embarked on a national tour last December and is finally making the rounds in Sheffield. 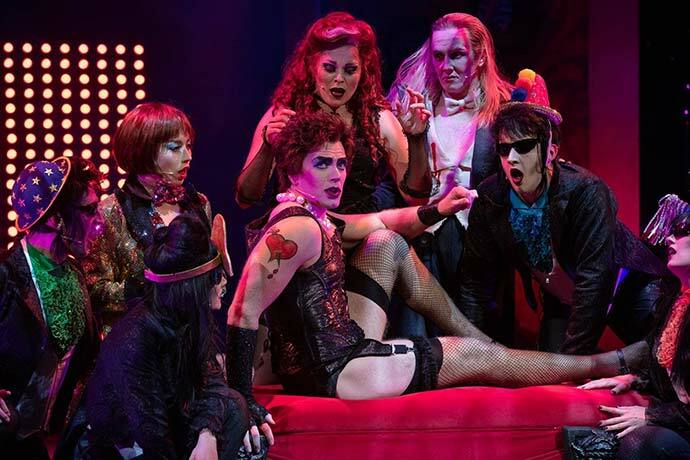 The Rocky Horror Show has been a cult favourite since it’s debut in June 1973 at the Royal Court Theatre. Originally only performed to a crowd of 63 people, the show was an immediate smash. It went on to be staged in Chelsea Classic Cinema, Kings Road Theatre and The Comedy Theatre in the West End before being adapted for the big screen. The film was a critical success, earning over $135 million at the Box Office. With it still being screened to audiences across the globe, it is now regarded as the longest running theatrical release in cinematic history. The Rocky Horror Show continues to be performed on stage, making appearances in over 30 countries and has been translated into 20 languages. Now, a new production of the legendary musical is making a stint in Sheffield this February. Directed by Christopher Luscombe, this version will star Hollyoaks actor Duncan James and West End star Stephen Webb as Frank, Strictly Come Dancing winner Joanne Clifton as Janet, a1’s Ben Adams as Brad and have Kristian Lavercombe reprising the role of Riff Raff. Having been on the road since December, the show has already received commercial praise, with The Times dubbing it as a “Panto for grown-ups – colourful, in your face, relentlessly energetic and high on audience participation” . With tickets costing a mere £10 and audience participation encouraged, we can’t think of an excuse not to go and belt out The Time-Warp. The Rocky Horror Show will be playing at Sheffield Lyceum Theatre from 18 – 23 February.